There are plenty of unusual wedding traditions we could sift through… the bungee- jumping-loving couple yelling their “I Doooo!”s as they take the marital plunge (pun intended) hand-in-hand. We could also discuss the couple whose favorite pastime is bowling, using the slippery lane as the wedding aisle. But for now, I’d like to touch upon an interesting place to get married, mostly because of the fantastic photos it produces. Underwater! 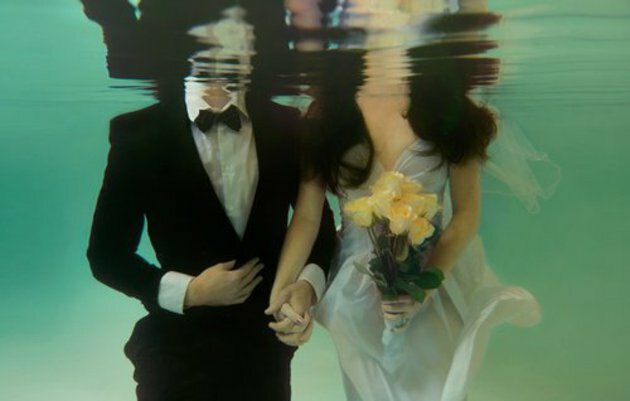 Yes, an underwater wedding is a romantic, unique way to exchange your vows, whether you’re crazy about the water or just want an unforgettable experience with really cool-looking photo ops. Plus, how symbolic! Dive in merely fiancées… emerge as refreshed newlyweds, ready to begin your new life together. You might think that a wedding ceremony so outrageous would be out of your reach, but there are now numerous companies who specialize in this rising trend of luxury underwater weddings. Packages range from $500 to $5,000, depending on your needs—how many guests you want to accompany you, whether you want a photographer or videographer (or both), live video streaming options (for unadventurous guests who’d rather wait ashore), music on board, etc. Most prices include scuba certification for those who need it, but double check with the company beforehand to avoid complications on the big day. And if the majority of your wedding party isn’t that adventurous (but still wanna get wet), a more prudent and affordable option is sticking closer to the surface, snorkeling your way to marital bliss. Even though it would be nice if all 200 of your guests could bear witness to the magical union, most of them will probably be waiting for you in a dryer area. 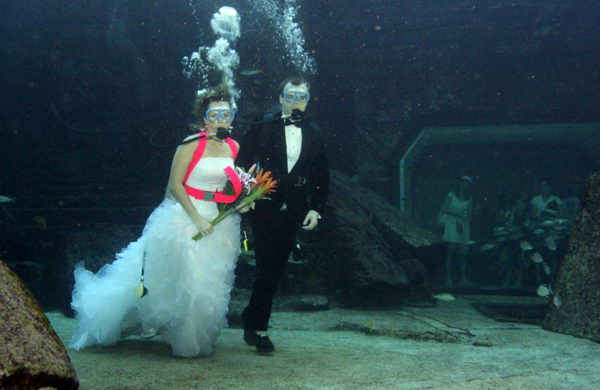 The great thing about underwater weddings, though, is that you don’t have to make them wait very long. After you change into your party clothes, you can commence your reception on a boat or a nearby beach! If you’re interested in pursuing this style of nuptial, or just want to find out more about it, check out ProDive International. You might also want to perform individualized web searches to see offers in your area or the location of your choosing.